Plastic has been around since the late eighteen hundreds and these invented substances have been called plastics because of their plasticity. Plasticity means that these materials can be molded and stretched into something. It is an ambitious task to research and study plastics. Instead of baffling you with poly this and poly that and academic level science talk, I decided to give you some background to plastics in the form of compelling videos. These videos will give you a brief history, and tell you how they are made and also what happens to plastic in various situations. I attached the videos because they are far more appealing to what I could write, which may send you into a glassy-eyed slumber of boredom. Now you know what plastic is and that we should avoid it. I can’t help but feel proud to say that we retired our kitchen rubbish bin. Yes, there is no rubbish bin in our home. There are other things though, like ecobricks and recycling containers, and I am happy to share some tips, tricks and solutions to help you on your journey to deplastify your life! This lovely picture is great head start. I suggest printing it and sticking it on the fridge or where you will see it often. It’s also a good idea to take a snapshot and save it as your phone’s background for a while until you get the hang of it. More information can be found from Plastic Free July. Another link to more information can be found here from Two Oceans Aquarium who have launched the #ReThinkTheBag Campaign. Let’s do It are going global on cleaning up the planet on World Clean Up Day on the 15th of September. Download their World Clean Up Day App to map polluted hot spots and add to their world wide data. This data will aid communities to pick places to clean on World Clean Up Day. Did you know that Greyton in South Africa has gone plastic bag free? They are officially the first and most noteworthy town in South Africa to ban the plastic bag. Whoop whoop Greyton! Who else have done this? There is a petition to ban the plastic bag in South Africa fir the reason that many South Africans don’t discard plastic properly. Add your name to this petition by clicking here. 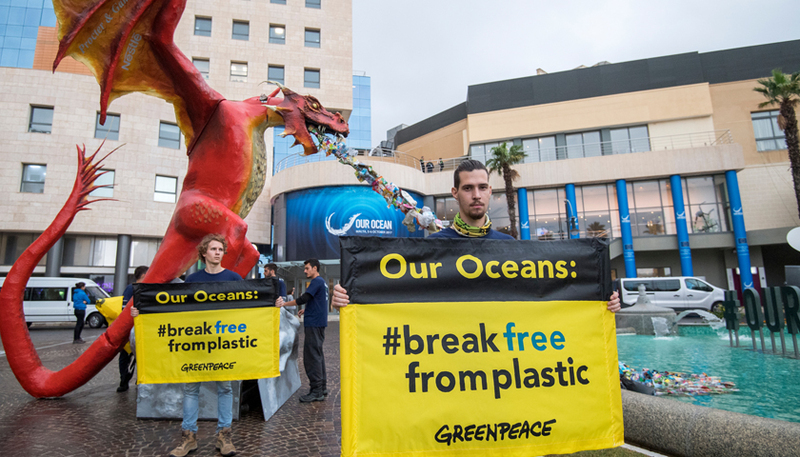 A #BreakFreeFromPlastic Campaign has been launched by Greenpeace because plastic has such a negative impact on the environment. Their Cape Town volunteer group are looking for more volunteers to help them raise consumer awareness and clean the Black River. To step up as a volunteer, you can email info@unicorncafe.co.za. Communal service is a great way to gain experience and knowledge because you learn so much from working with different people and implementing projects. If you are looking for a job or want to build your CV, adding community work is attractive to the employer because it shows that you are a team player and care about social or environmental issues. Doing community work certainly also shows that you have initiative and a ‘can do’ attitude which puts you above other applicants. To find out more about why volunteering and community service helps you, click here. Finally, ecobricking is a great way to contain plastic that you cannot avoid. Click here for more information.